Is your Nonprofit’s email open rate by your subscribers very low? Are you experiencing that people are not opening the mails sent by you and hence are not taking the desired action based on your content? The solution is to increase email open rates by applying simple straightforward strategies. Adopting the strategy of ‘email marketing’ is important for Nonprofits because it is an indispensable part of engaging and targeting donors, potential leads and supporters. The reason why email marketing is an ideal channel to build a support base and engage an audience is its phenomenal reach – In 2013, there were 3.6 billion email accounts of which 91% check their emails regularly. A report by Hubspot reveals that 59% companies are integrating emails and social channels and with regard to online purchases 66% of consumers have made a purchase online as a result of an email marketing message. Evidence shows that ‘email marketing’ has the highest engagement rate and is a strategy with high returns on investment. A Nonprofit can market its objectives, mission, and drive fundraising campaigns through effective personalized emails. Econsultancy reports that companies that utilize the personalization of mails have shown an increase of 14% in their sales. 94% business houses stated that personalization is critical to present and future success. The Open rate of a personalized email increases manifold, when Nonprofits have an appealing tagline, a strong subject line, avoid spam filters and establish a conversation and relationship through their emails. Constant Contact states that open rates of emails is only about 21% for Nonprofits and thus it is essential to have a comprehensive ‘email marketing’ campaign. First Impression Matters– Send a welcome email when someone subscribes to your mailing list. In this mail, explain to your subscribers who you are, the frequency and content of mails you will send them. Vero, email marketing company states that 74.4% of consumers expect a welcome email when they subscribe to a list. Ask Subscribers the Right Question– Simply broadcasting your message is perhaps not enough. Asking subscribers the reasons for visiting your Nonprofit home page and which component of your social mission or field interventions or ongoing activities interest them. This shall also provide you ideas for framing targeted emails. Don’t send Unnecessary Mail– 35.4% Consumers unsubscribe from emails because they are sent too frequently. Donors/Subscribers/ Potential lead do not like to get loaded with unnecessary mails from your organization. Keep your mails marketing messages to the most important with an appealing content. 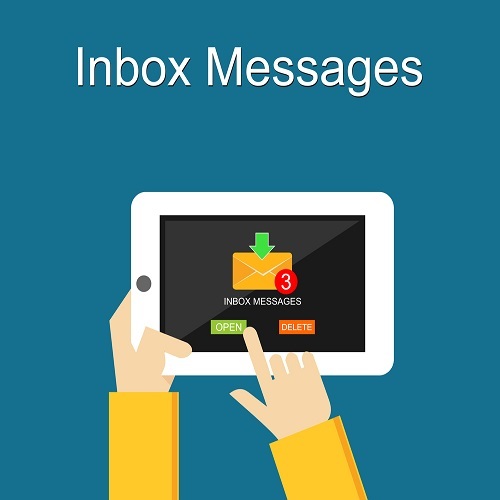 Have a Subject Line which Establishes a Connect– Your subscriber might be having a near 500 mails in the inbox. Do add ‘Re’ to the subject line and address it personally to the name of the subscriber. Avoid phrases like ‘free’, ‘help’, ‘reminder’ and keep the length short and crisp. Stats show 22.3% Open-rate increase with personalized subject lines. 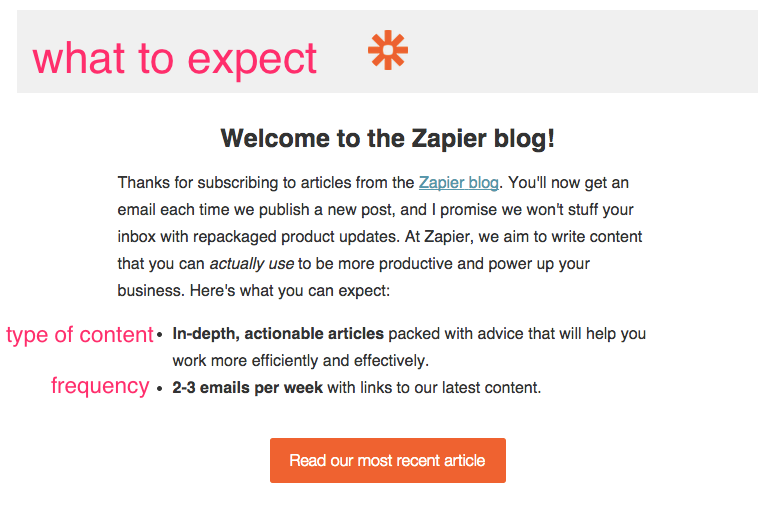 For example, when you subscribe to Zapier, the welcome mail clearly states the type of content they will send and the frequency of their emails. The subject line of the mail clearly defines their objective too. Send Mails at a Right Time with the Mention of Location – A study by Experian states that click rates were highest in the weekends when the volume of emails were low. Timing of sending a mail is critical and Nonprofits have to do a bit of analysis and research and determine the best times for their message. Providing a city name too can lead to an increase in open rates of mails. Sending mails very early in the morning might get overlooked or sending late evening might not get read and be postponed for the next day. Stats highlights that 10pm-9am is the worst time to send emails. Send the Mail from a Person and Not from Nonprofit the Organization– Sending the mail on behalf of the President or Head of your Nonprofit shall escalate the opening rates. When the mail comes from an actual individual it does get opened. Personalized emails build connections. 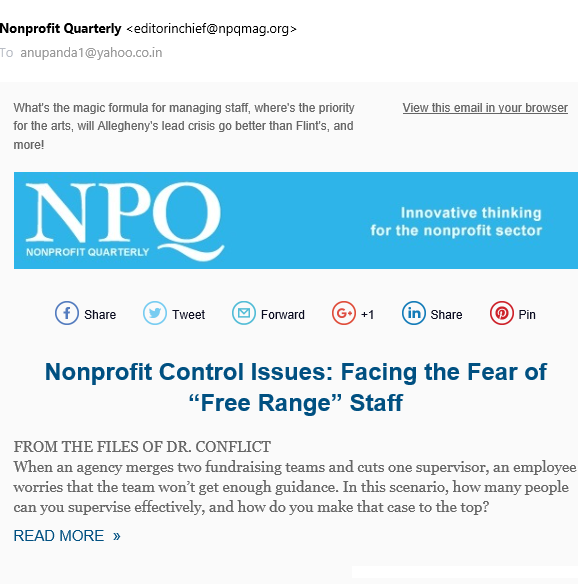 E- Magazine NonProfit Quarterly mails comes from the Editor-in-Chief. The recipients will like a personalized strategy of a mail coming from an individual and this is one of the best ways to keep the open rates high. Have a Strong Content– Sending high quality, specific and engaging content in mails shall enhance the opening rates. Metric Reports of Mailermailer states that 2% is the Open rate of emails with personalized content. Nonprofit’s mails have to be informative, engaging and objective oriented. Mails constantly on promotions, donations or fundraising might annoy your subscribers. Avoid Spamming– Offer your subscribers’ subject and content of value. Never write vague subject line to attract attention. Usage of words in capital caps like free, lifetime opportunity, deals, results in the mail going to the spam folder. 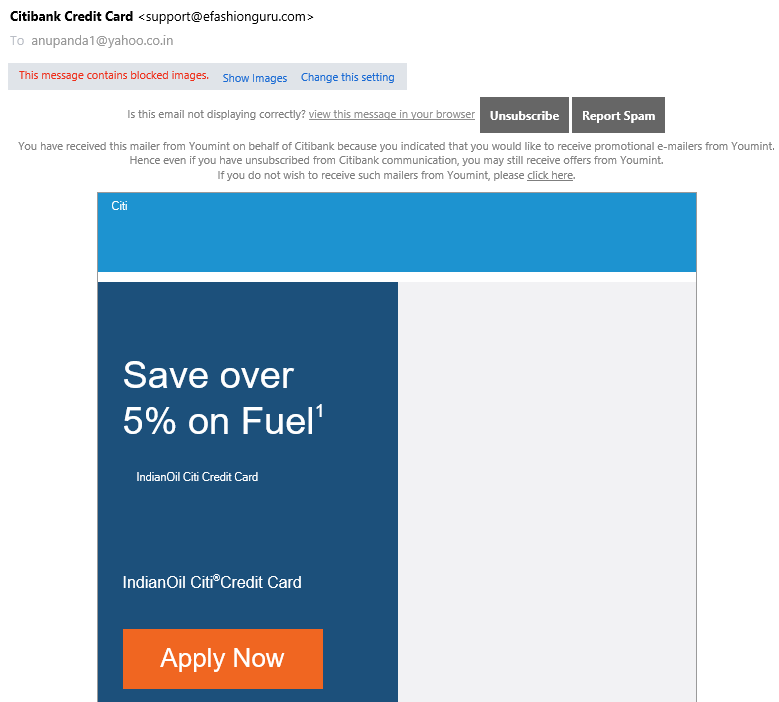 Frequent Mails from various banks or financial institutions with an off-putting subject line dissuades the subscriber from opening the mails and repeated mails with such subject lines automatically goes to the Spam folder. Format Mails for Mobiles– KISSmetrics highlights that 70% subscribers delete mails which cannot be accessed on mobile device. Litmus data shows that 68% of Gmail and Yahoo opens are from a mobile device. When the emails display clearly on mobile, Nonprofits will be able to improve their open rates, enjoy higher engagement and more clicks. Update and Segment the Mailing List – It is advisable to keep track of mails which are bouncing and also tab subscribers who are not regularly opening your emails. The mailing list has to be updated and kept fresh by removing inactive subscribers. 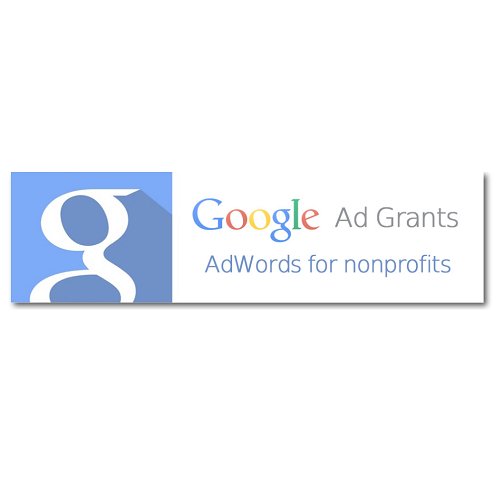 There is a need to segment subscribers in the basis of their interaction with your Nonprofit. They can be listed as donors, community members, crowd- funders, philanthropy for sending relevant, focused mails and improving opening rates. Harmonizing Personalized Emails and Landing Pages – Pairing personalized mails with the Nonprofit’s landing page shall heighten the email open rates. The landing page has already attracted the donor or potential lead and writing custom emails for the similar segment on landing page can be a catalyst to increase email opening rates. Entrepreneur India shares the case of a fitness organization whose clicks on emails increased from 1% to 8% after promoting this approach. 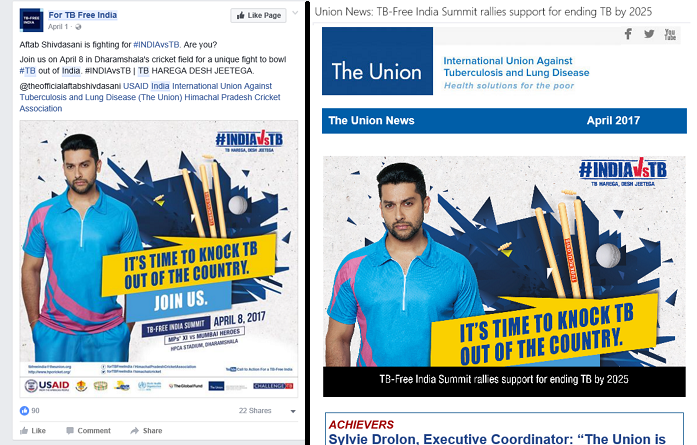 The International Union Against Tuberculosis and Lung Diseases uses the same picture and content on their Facebook page and in the subscriber’s email. The Facebook Page focuses on gathering support and resources from donors and community while the email gives a detail of activities envisaged, the interventions being taken, the expected outcome with various other success stories. 2015 Response Rate Report of Direct Marketing Association states that “Direct mail remains a strong and successful marketing channel” and produces the same Return on Investment as the social media. So time to brace up these effortless easy techniques and stay connected with subscribers and supporters.